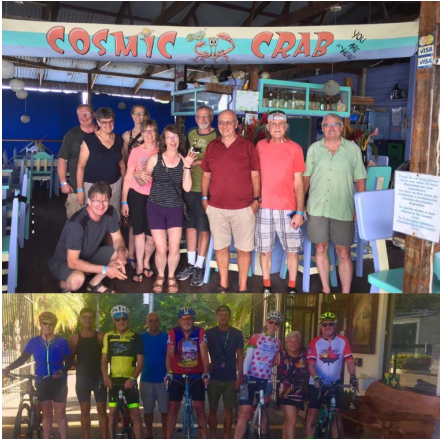 This February, ten cyclists, predominantly EBTC’ers from Edmonton, joined Bob Fletcher’s “Tailwinds” Tour of Costa Rica. Over 16 riding days, we covered about 950 km total distance and 11,630 meters ascending. (Average day: ~60 km and 730 meters climbing). We had a three-day rest “holiday within a holiday” in Panama as well. 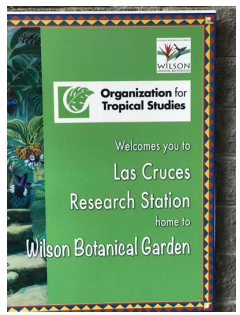 This was the second year of Bob’s tour of Costa Rica and it is only getting better. It’s a really good mid winter cycle training camp and a great holiday at the same time! On arrival in Liberia, Bob and his team picked us up at the airport in the 15-person van and bike trailer that would shuttle us and our luggage and bikes everywhere needed throughout the trip. Westjet had been merciful to the bikes in transit and after putting them together at our hotel in Tamarindo we had time to check out the beach until dinner. All dinners are included and provided at a variety of interesting local restaurants. Riding started the next day with a seemingly very hot 60 km (having been cross-country skiing only a day before!) and a stop in a little town where they make pottery by hand – and have been for over 400 years. 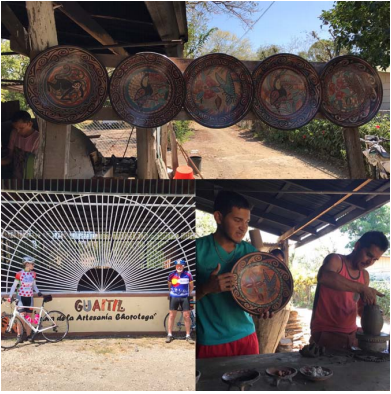 They gave our group a demonstration and tutorial on the pottery making and glazing traditions of that region. Over the next few days we did rides of about 60 km average through the west coast towns of Samara Beach, Nicoya, Uvita, Jaco, and Quepos, generally heading south along the Pacific coast about at the center of Costa Rica. 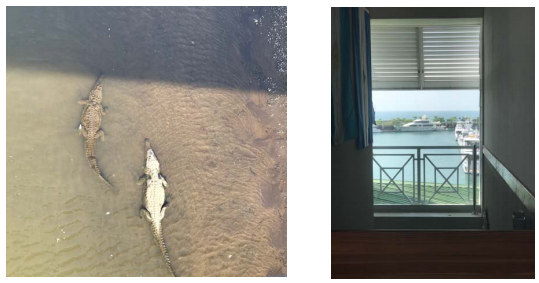 This included riding through melon farms and extensive palm-oil date plantations, a pleasant ferry ride to cross the Gulf of Nicoya to Puntarenas and a walk out onto the locally famous “Crocodile Bridge” (see photo – don’t drop your phone!). That afternoon and night was spent in the really lively beach tourism town of Jaco. The next day’s highlight on reaching Quepos was the beautiful Marina where we had lunch. Riding on, at the village of Sierpe, Bob had organized a 3 hour river nature-cruise through the largest wetlands in Costa Rica. (Cue numerous quips about Gilligan’s Island “3 hour tour”!). 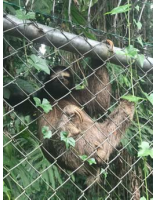 The wildlife was amazing; monkeys, birds, bats, snakes, fish, small mammals, and a sighting of a pair of brightly coloured big-beaked Toucans by Diane. The nautical theme of including ferries and boats for our journey along this coast continued after one of our longer rides the next day (~80 km) to Puerto Jimenez where we had a 20 km open water crossing of the Golfo Dulce (Gentle Gulf!?) under nearby thunderstorms –in a rather small boat- to a peaceful harbour town, Golfito, where we stayed at the beautiful Marina hotel. From Golfito we partly rode, and partly shuttled on (where the road got narrow, twisty, busy and over 20% grade) to stay at an amazing botanical garden reserve and biological research station in the high interior. We had a guided tour and ate dinner cafeteria-style mixing in with the students and researchers in residence there. This also brought us into the cooler highlands of central Costa Rica where we would ride several more days. Highlights in this area were the beautiful Orosi town and valley and the Turrialba volcano. We stopped to see the lovely little church in Orosi and continued on very smooth quiet country roads lined with coffee plantations. Next day we had a challenging ride to Siquirres and then bused it to our first Caribbean-side seafront hotel just south of Limon. From there, on our thirteenth consecutive day of riding, and our longest but probably flattest day, we followed the coast through the little beach towns of Cahita and Puerto Viejo, and we rode literally to the end of the road; to where jungle starts and the border of Panama lies. 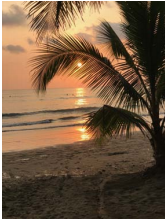 After lunch on the beach and some “cheap bubbly” popped by Bob to celebrate our upcoming rest days, we rode back to Puerto Viejo for the night and stayed in a cute little boutique hotel. An Orangutan was hanging out on the fence just outside our room there. After visiting a unique locally-made chocolate shop and walking the beach, dinner was quite a party: whole small barrels of beer on the table, not to mention 2-for-1 cocktails…and well…, you get the picture. At this point we left our bikes and main luggage and with just a few days things in backpacks, we took a ride to the border and walked across the bridge into Panama! Then followed two more water taxis (another SS. Minnow experience!) 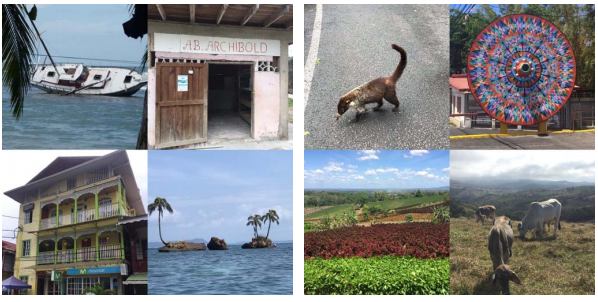 to the holiday island region of Bocas Del Toro and two nights at the “Cosmic Crab” hotel. On our first full day of “beaching it” we hired a boat cruise to a beautiful national park island beach. 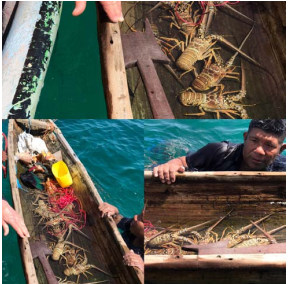 At one point our boat driver motored carefully over to where a lobsterman was diving and bought his catch from him while he was still in the water! (New meaning to fresh seafood!). 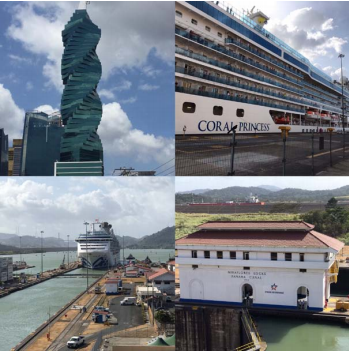 Now, if this doesn’t already seem like a very fun and thorough tour, you won’t guess what’s next (and showing how creative Bobs holiday planning is): why not just fly to Panama City to see the Panama Canal! !…And we did! We arrived early enough in the morning to explore the city, take a tour to the canal, and a visit the old French and Spanish parts of the city. 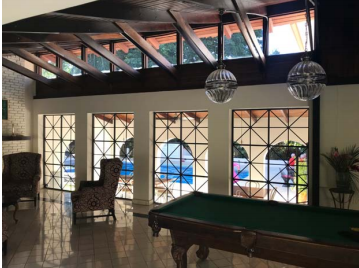 Next afternoon, after more sightseeing, we flew back to San Jose, Costa Rica and were met again by our trusty driver and van, and brought to a beautiful estate house / hotel near Alajuela in the central highlands again, just north and west of San Jose. This place stands out in its serene beauty and architecture that struck me “like a monastery….well, if a monastery had a bar and a pool…” From there began our last four days of riding back in the overall direction of Liberia again, through hilly cooler high country. We even got rained on…without anyone getting hypothermic! The countryside on those last four days is hilly, with interesting towns, coffee plantations and mountain vistas. In Sachi we saw the world’s largest traditional style decorated Ox cart in the town center and continued on to the city of San Ramon to stay in a wonderfully quirky eccentric family owned hotel. The last four days had some of the steepest long hills and 1000 meters or more of climbing per day on average. On the second last day we rode past plantations that apparently supply most of all the topical houseplants bought for homes worldwide. We ended the day in a hotel right under the shadow of the almost perfectly cone-like volcano Mt Arenal (which was active from 1968 to as recently as 2010) in the town of La Fortuna. Our last two days involved a 1200 meter climbing day along the north shore of Lake Arenal , a night at “The Living Forest” Lodge, and finally a “screaming” very windy descent (i.e., brakes and rider both screaming !) to the town of Canas. Readers may have questions about other aspects of this tours organization. The 15-person van that Bob hired, with driver, for the entire duration is a really great way to move riders around to where the riding is good, and to leap frog forward to new scenic areas and was very well used to do that. The trip also accommodates e-bikes, and with the staff comprising driver, trip leader, and assistant trip leader/mechanic, every day’s ride was responsibly followed by a sweep person. We never lacked for water, help changing flats, or an air conditioned opt-out option if the heat demanded for anyone. While in Costa Rica, all meals were included for us, and for most dinners we’d go to a restaurant and simply pick “anything reasonable” off the menu.